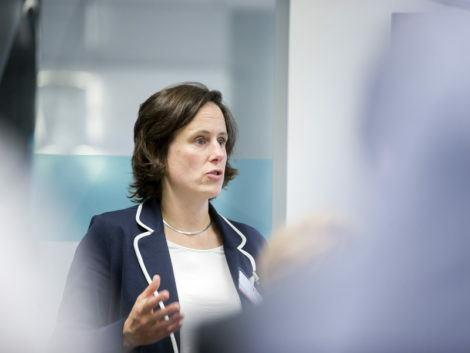 Silverstone Technology Cluster Chair Roz Bird believes a multi-sectoral ‘super cluster’ spanning Cambridge-Milton Keynes-Oxford (CMKO) has the potential to surpass government predictions that it can generate £1.6bn of GDP annually for the UK economy. Throughout 2018 Roz has appeared as a guest speaker/panellist at several high profile events focusing on the well documented CMKO growth corridor. More recently these have included Built Environment Networking’s CMKO Corridor Economic Growth Conference’s, Highways UK’s ‘Delivering a World Class Heartland’, South Northamptonshire Council’s Innovation & Investment conference, SEMLEP’s AMG and an EG property event in London. Roz commented: “On a platform this year I have talked about how we have taken the MEPC ethos of creating a community of mutual regard beyond the boundary of Silverstone Park. “Setting up Silverstone Technology Cluster has enabled us to reach out to many more companies in the wider geography to help them to network and grow. As well as cluster organisations, the super cluster includes many of the UK’s major R&D assets including the Genome Campus, Harwell and Bletchley. It also boasts some of the best hospitals and universities in the world, all concentrated in one area and benefiting from close proximity to London and the Midlands Engine. She continued: “The feedback from audiences has been very positive; people are telling me that they like the vision and idea of a super cluster.